Calvin Harris is seen with a black Fender Geddy Lee Jazz Bass at 0:28. Start it at 0:27 seconds because it is only a glimpse of him playing the bass. Flowers can be seen using a Fender Geddy Lee Jazz Bass at 1:08 in this video. Mark Stoermer is seen playing the Fender Geddy Lee Jazz Bass. Mark can be seen playing this bass in many live performance stills. This is Geddy Lee´s Fender signature bass. A replica from his "number one" black ’72 Jazz Bass that he discovered at a pawn shop in Kalamazoo, Michigan. Brendon can be seen using a Fender Geddy Lee Jazz Bass. This gif was taken from the Mad As Rabbits music video. "My favourite bass ever to date is my Fender Geddy Lee Jazz. For a number of reasons (70s pickup placement, Leo Quan Badass Bridge, body/neck material), this bass has an ungodly amount of growl, yet is low-output enough to be utilised very well with overdrive". This video shows some of the equipment used by Paulo for the recording of Sepultura’s album "Kairos". The Geddy Lee Jazz Bass can be seen as of 2:45 (second from the left). he used fender geddy lee jazz bass on tour on discipline song and on the new album. 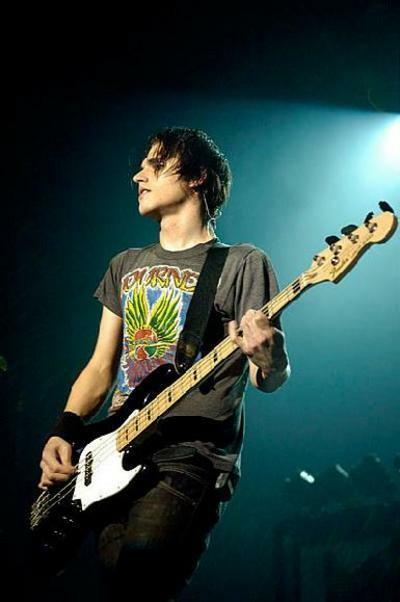 Matt Taylor can be seen using a Fender Geddy Lee Jazz bass. The bass has had multiple pick guards throughout the years. "More awesomeness!!! #PierceTheVeil #TonyPerry #Fender #AmericanProfessional #Jazzmaster #AmericanPro #guitar #Rush #GeddyLee #JazzBass #JBass ??? #Repost @tonyperry ??? Today's gonna be a good day ???? thank you @fenderbilly and @fender!!! ???? 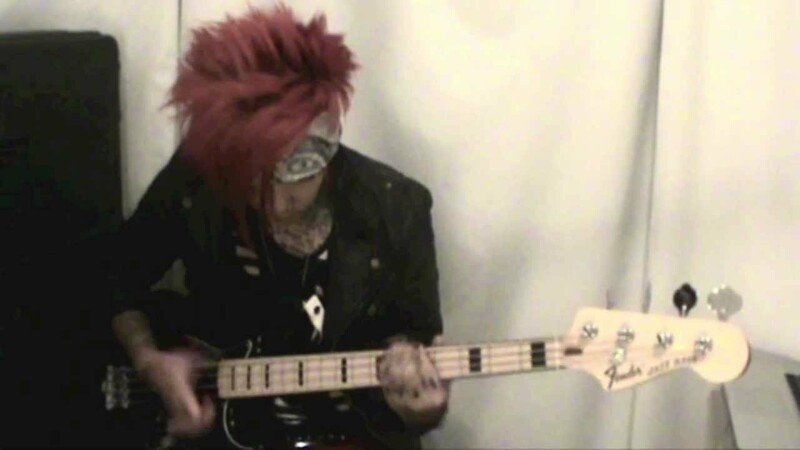 : @sammyroenfeldt"
In this Instagram post, Joel can be seen with a Fender Geddy Lee Jazz Bass, which is "heavily modified," according to Joel, in the comments section. 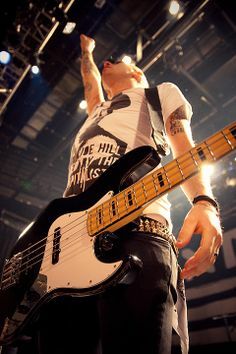 During A Day to Remember's 2009 tour, Josh mainly used a Fender Geddy Lee Jazz Bass. Alex used a Fender Geddy Lee Jazz Bass, in black finish. At 7:50 he talks about using this bass at home while he's not on tour. Seen in this Instagram post. In this photo we can se her using a Fender Geddy Lee signature Jazz bass. This is my main bass to play live. Fast neck and a good tone. The main thing I don't like about it is the separate volume knobs for each pickup. I am primarily a guitarist but have recently taken up bass as a sideman for a couple of projects as well as playing bass on original compositions... I can honestly say this particular bass is most fantastic to the touch and feel... I put some Rotosound 65-115 and tune down a half step... big, bassy and ballsy! Great thin profile neck... I also swapped out the white pick guard for a black one to match the look of my 73 Fender Strat... loves it!!! I have the Japanese produced Geddy Lee Jazz Bass. I have toured it with almost every band I have ever played in and absolutely love the tone and feel. Sounds and plays great. I've got the sunburst model which reminds me of Jaco's jazz bass in the color department at least. With the pickup spacing like they had in the early 70s with the treble pickup nearer the bridge you get more aggression from this Jazz than most. However, the stock pickups have rather low output. This isn’t nevcessarily a bad thing I just prefer hotter, more responsive pickups. I’m considering a J-Retro preamp by John East to give the bass more oomph. Somethine about this bass makes it such a pleasure to play, the notes flow smoothly into each other. Sold my MIM Geddy Lee Jazz to fund a vintage jazz bass. Been regretting it ever since. A used MIJ came up and didn't hesitate to grab it. Super fast neck, fun to play. My favorite, easily! For the price, a great instrument for anyone from a student to a professional. My daughter has mine at the moment, but I used it for years on stage. Mine's a 2002 from a pretty good year at the Fender Japan factory. I hear the Killers' bassist has about a half dozen of these for their tours because they're so dependable and consistent.